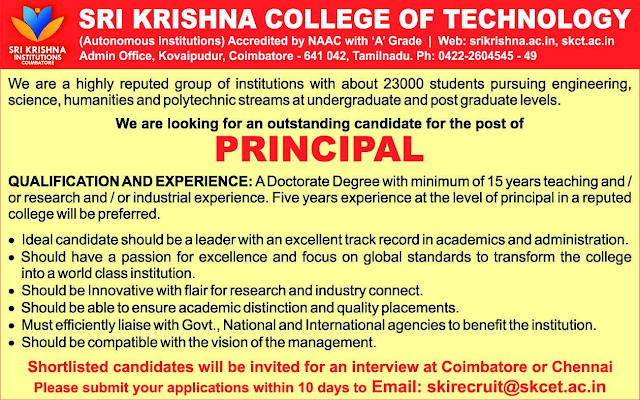 Sri Krishna College of Technology, Coimbatore has advertised in THE HINDU newspaper for recruitment of Principal job vacancy. Interested and eligible job aspirants are requested to apply within 10 days from 10th April 2019. Check out further more details below. About College : Sri Krishna College of Technology was instituted in the year 1985-1986. The college is accredited with A Grade by National Assessment and Accreditation Council, Bangalore. The college has been granted autonomous status by UGC during 2011-2012 and approved by AICTE, New Delhi and has a permanent affiliation to Anna University, Chennai. Housed in an area of 51.39 acres with a total built-up area of 1,00,000 sq.m. build up Area. SKCT has a distinctive collegiate structure with exemplary academic buildings, laboratories, library, hostels and play ground where the students experience pleasant and amiable intellectual ambiance. Ph.D with 15 years experience in teaching or research or industrial. Candidate with 5 years experience at the level of Principal in a reputed college will be preferred. How to Apply: Interested and eligible candidates are requested to send CV along with all copies of certificates / testimonials and recent PP size photos to the email address. Shortlisted candidates will be called for interview at Coimbatore or Chennai.